The use of Automated Content Recognition (ACR) technology is poised to change television advertising as we know it. ACR can recognize unique television content on connected devices, such as smart televisions and mobile phones, including the ability to track unique television ads being viewed on these devices. We can already track what consumers are doing online, but what has been missing is the ability to track offline advertising exposure with the same level of granularity. As ACR becomes more widely adopted, offline advertising (including television and radio) will become as measurable as online advertising. As exciting as this sounds, we don’t yet have enough consumer level ACR data to see a complete picture. This hasn’t stopped some companies from hyping current ACR-based solutions as the holy grail of solving offline to online media attribution. Before you get sucked into the media attribution reality-distortion field, you should be aware that their limited attribution results may also be based on a foundation of bad data. We shudder to think of the harm this is causing networks and advertisers. Before diving into the specifics, let’s first examine how television media attribution works. At the most basic level, television media attribution involves tracking when ads run and attempting to associate any measurable lift in online activity to the television ad. When television schedules consist of ads running in close proximity across multiple networks, this approach becomes problematic with the resulting insights being merely directional at best. Advertisers are looking for more accurate attribution solutions, which is where ACR running on smart televisions comes into play. In the above example, we see a family with an ACR enabled Smart TV viewing an Expedia ad on ABC. Before the ad break, the ACR technology recognized the programming as being associated with ABC Network. TV commercials can also be fingerprinted in order for smart televisions to recognize them. In this example, an Expedia creative was detected at 3PM. Since Smart TV’s are connected devices, the household IP address is known. Any subsequent website visit from the same consumer household will share the same IP address allowing attribution companies to associate the website visit to a specific ad exposure. Now, here’s something to think about. What if Expedia is running this ad nationally on ABC at the same time they are running it on the local ABC affiliate? The attribution company must determine which media company ran the commercial at 3PM. The media attribution company is going to need post logs from the local ABC affiliate and from ABC nationally to determine which media partner to give credit to. Getting post logs on a real time basis can be a real pain for attribution companies. In order to solve this problem, some are also using ACR technology to monitor ads running on broadcast and cable networks to understand the timing of each airing. However, there are challenges with monitoring network feeds which can lead to inaccurate attribution results. To help explain, let’s review a diagram of how national cable television ads are delivered to consumers. On the left side of the above diagram, a cable network sends its signal via satellite to two different Multiple Video Program Distributors (MVPDs). MVPD is a catch-all phrase to describe all of the television distribution companies that sell access to cable programming via cable, satellite, fiber, or via internet (for those of us who have “cut the cord”). It’s important to realize that there are two different types of ad breaks in the mix. We have the national ad break, in which commercials are seen by all viewers nationwide, and we have a local ad break. As shown above, the cable network is airing an Expedia spot in the local ad break. Local ad breaks are preceded by a Digital Program Insertion (DPI) signal. Most MVPDs have ad-insertion equipment that listens for the DPI signal. As soon as the DPI signal is detected, the ad insertion equipment begins inserting commercials sold to local advertisers by the MVPD. In the above diagram, one of the two MVPDs is shown inserting a Flex Tape commercial covering up the Expedia commercial. 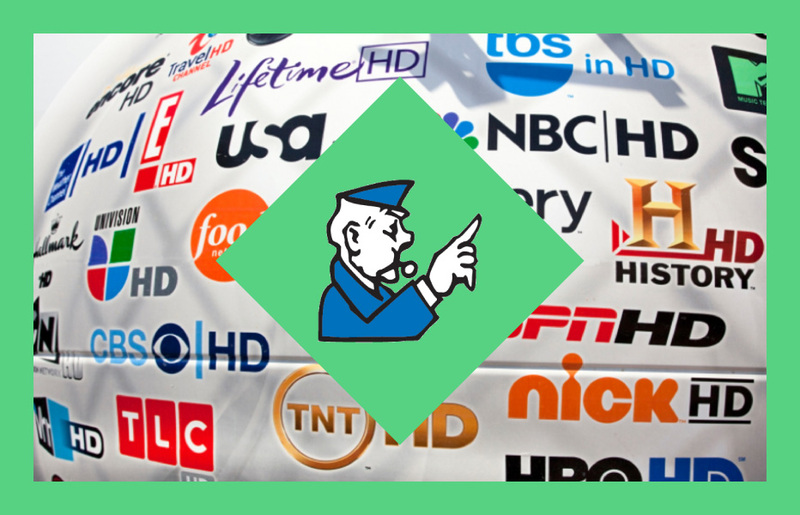 In most markets, including the vast majority of urban markets, the MVPDs aggressively sell local advertising covering up most, if not all, of the ads inserted by the cable network. However, in smaller rural markets, the MVPD may not sell local advertising allowing the Expedia ad to be seen by viewers. The second MVPD above passes through the Expedia ad to viewers in their market. As an ACR monitoring company, DRMetrix monitors commercial-grade feeds ahead of local MVPD ad inserters. This allows for accurate reporting of the ads being inserted by the cable networks in both national and local ad breaks. DRMetrix understands that the network above ran an Expedia ad in their local break while other companies, monitoring consumer grade feeds, may incorrectly conclude that Flex Tape ran on the network. Unfortunately, the DPI signals that allow DRMetrix to recognize that Expedia ran in a local break are removed by the MVPD and are not included in consumer grade feeds. Without DPI signaling, it is easy to confuse break types. 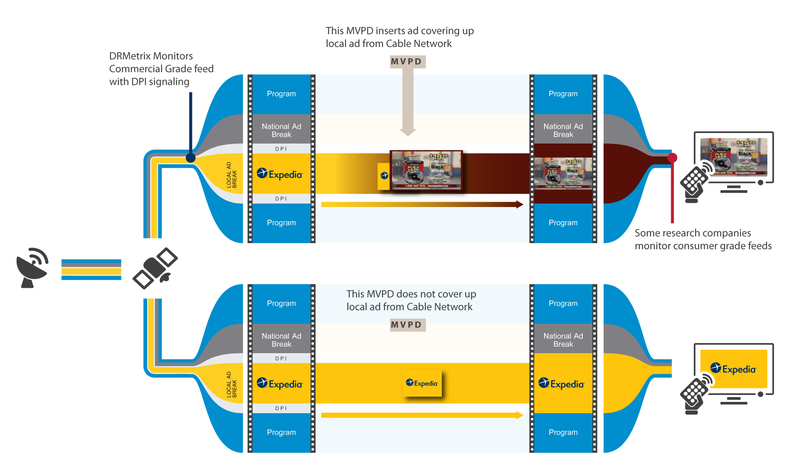 Additionally, with consumer grade feeds, it is impossible to see the ads being inserted into local breaks by the networks because of MVPD cover up. To try and solve for their inability to detect the break type, some attribution companies have taken to monitoring consumer grade feeds from multiple markets. If they see the same ad appearing in two or more markets they assume it is running on the network and will report the airing as national. There are problems with this strategy because MVPDs are able to insert ads across multiple markets, regionally, or even nationally across their entire footprint. It has become common place to target consumers regardless of locality via programmatic and advanced cable advertising models. Many of these models are able to target viewers across multiple MVPDs as well. Given that targeted cable advertising is the future, the problem is only getting worse over time. These are just some of the reasons why ads can appear to be national when in reality they are reaching a much smaller audience. Unfortunately, attribution companies monitoring consumer grade feeds often report local ads like Flex Tape (above) as national. Since consumer response to a local ad is a mere fraction of a national ad, the attribution company may conclude that local airings, mistakenly associated with the cable network, are under-performing thus penalizing the networks. Additionally, how about all of those local spots that Expedia and others are buying from the networks? Despite the fact that they are being seen be viewers in various parts of the country, the attribution companies can’t see these airings if they are monitoring consumer grade feeds. This results in the networks not getting credit for any of the consumers who viewed these local ads and took action. This is not a minor problem since many television campaigns run a substantial percentage of airings in local breaks on the networks. When trying to measure the effectiveness of national cable advertising using smart television ACR data, the challenge for attribution companies is to isolate which ACR detections correlate to specific national cable airings in both national and local ad breaks. Since many of the smart television ACR detections stem from other TV advertising channels such as local cable, direct to consumer satellite, over the top services, programmatic, and advanced cable advertising, it is imperative to use commercial grade feeds to in order to properly associate which smart television households were exposed to true national cable ads. Today’s attribution models are tenuous enough without incorporating inaccurate airings data into the mix. Monitoring of consumer grade feeds results in bad data, false conclusions, and unfairly penalizes cable networks. Numerous problems also exist when airings data from consumer grade feeds is used for competitive media research and/or airing verification. Advertisers should be aware of how their attribution company is acquiring airings data. If post logs are not being used, advertisers are encouraged to compare the spot detections reported by their attribution company against their own post-logs and/or affidavits. ← Bringing in the holidays with new networks! Interesting post. Wouldn’t attribution based on viewing data from SmartTV’s add more accuracy to the picture? They are monitoring what is actually airing on millions of screens across every market in the country. Hi Carl! Indeed using Smart TV data would add more accuracy but only if that data is interpreted correctly. As an example, if we are trying to determine which smart TV ad detections correlate to national cable airings, we need to monitor the ads that the actual cable networks are running in both national and local ad breaks. Based on the timing of those ads, we can then look at the smart TV data and know which ad detections associate with the cable networks as others may associate with local cable insertions, advanced advertising, programmatic, etc. In my blog post, I attempt to expose deficiencies that result when cable networks are monitored using consumer grade feeds without DPI signaling. This makes it impossible to accurately associate smart TV ad detections to national cable airings for all of the reasons described in the post. Feel free to post any further questions! Thank you.